I didn’t want to leave Seattle. I fought fleeting thoughts to change the locks on our downtown loft, and claim it for our own. We were within walking distance to Pier 57, a quick drive to Ballard, which we so loved, and far from Saskatchewan’s impending winters. I was sold. Bob, however, said something about having a career and being an adult. Wishful thinking, on my part. Thankfully, I knew I would feel this way, and had planned ahead of time. I needed one last adventure, the real culmination of a beautiful trip. 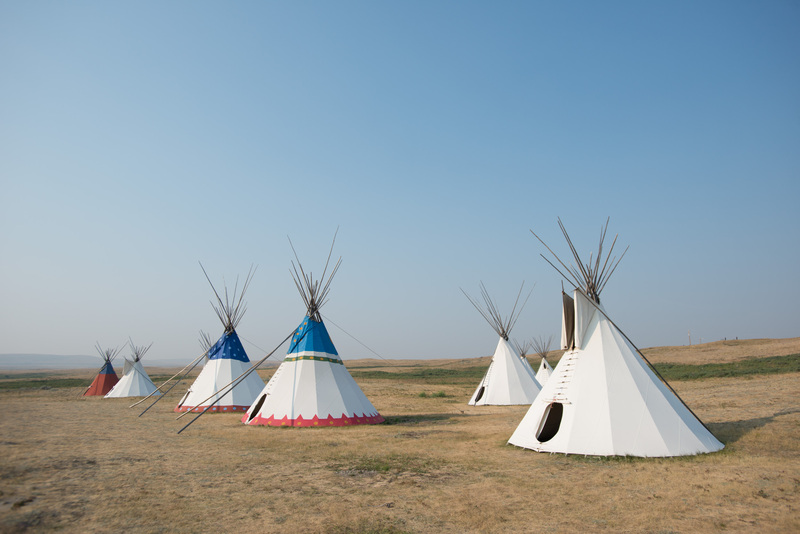 So I did what any logical person would do – I booked us for a one night stay in a Tipi Village. We left Seattle heading eastbound for Browning, Montana, with nothing but an open road and some groceries we picked up to tide us over. It was a long day of driving, but we love road trips! We neared Browning, and could see mile markers counting down our arrival. How exciting! Then, we saw an alternative turn off, a more scenic route, dare I say. Even better! 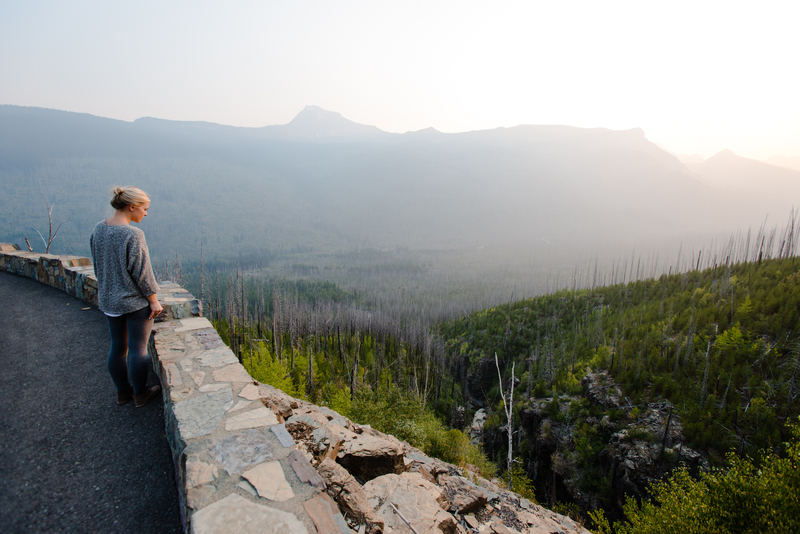 We had made good time, and I told Bob that heading down Going to the Sun Road would be a brief add on to our drive. So, without hesitation, we turned left. A narrow road with generous tree covering followed. “How romantic!”, I thought. Little did I know, alongside me, Bob thought “Why are we on this road?”. Oh wait, I did know that. He voiced that concern as soon as we were 30 minutes into what seemed like a fruitless drive. I turned an reassured him that something amazing lay ahead of us. So he drove, me munching on crackers, and holding out for hope that there truly was something worthwhile ahead on this godforsaken road. Would it take us to the sun? Would we have tacked nearly 3 hours extra driving on for no reason? Time would tell. Then, it happened. The trees gave way to a slightly broadened road. It yielded a nice place to pull over, stretch our legs, and like any true lady, twerk on the car at Bob’s request. We snapped a few photos, and continued on for a few minutes. Then, the magic happened. Around a curve, through a haze of smoke was a viewpoint unlike any other I’ve seen. 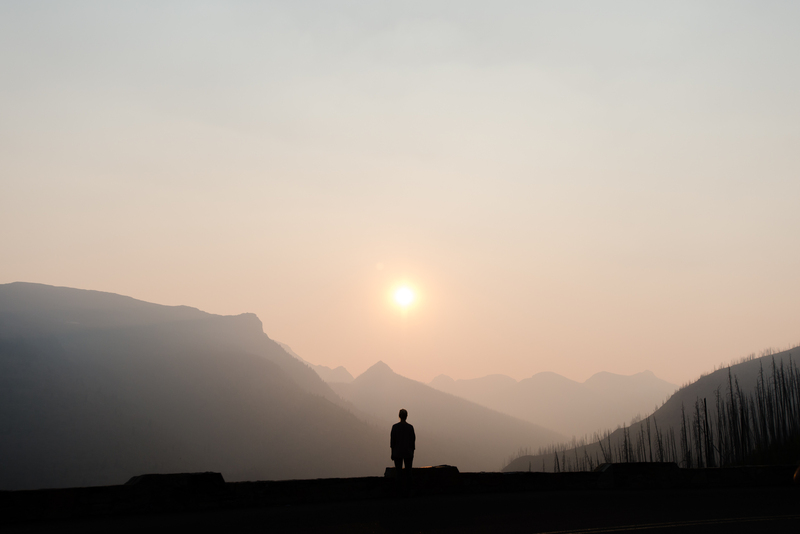 We had a unique experience, due to the wildfires raging upstate at that time, and a diffused pink sunset slipping behind the mountain range. So surreal. I stood there taking in the moment while Bob snapped photos. Knowing me, I was of course tempted to climb over the ledge and dangle my feet over a plunging fissure in the rock. I wanted to be closer to the only flowing waterfall we had seen so far. 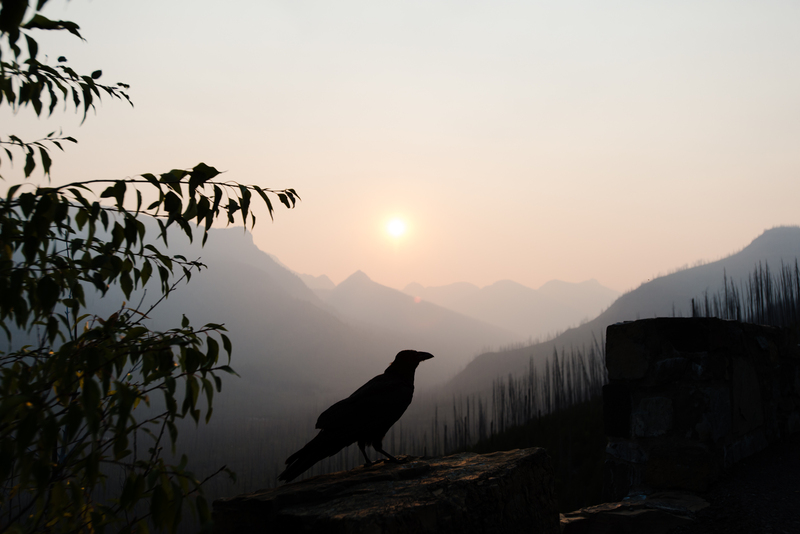 Bob advised against it, and I lived to tell the tale of Going to the Sun Road. We slept well, and woke up to a bright Montana morning. Beautiful! The plains where our tipi was situated stretched for many acres, with gray hazed mountains in the distance. I’m so glad we stayed there! Now all that remained was a ten hour drive home, and more pepperoni to sustain us for breakfast. Note to self: next rustic tipi adventure, bring a granola bar.